Neil Young completists, take note: two of the rock icon's best films are finally coming back to DVD. 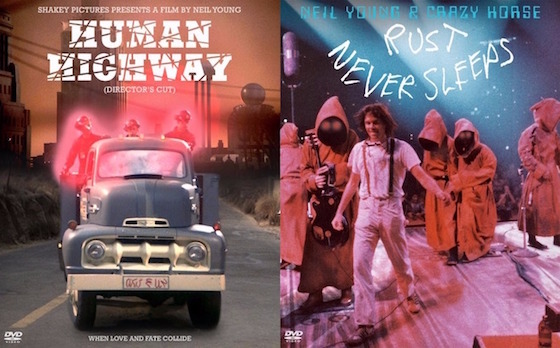 The classic 1979 concert movie Rust Never Sleeps and the mega strange 1982 post-apocalyptic comedy Human Highway will both be released on DVD on April 22 via Reprise. Human Highway stars Young alongside Dennis Hopper and Devo, among others. The film has been digitally restored for this DVD release. If you pre-order the DVDs on Young's website beginning on February 29, you'll receive a free, limited-edition poster, and you can grab both as a bundle.